The Salvation Army's mission spread across the country, reaching the streets of Fond du Lac in 1890. The organization works hand in hand with the Fond du Lac community to operate the county’s largest food pantry, it’s only warming shelter and a wealth of year-round and seasonal social service, crisis prevention and self-sufficiency programs. Majors Jon and Kim Welch arrived at The Salvation Army Fond du Lac Corps and began their new assignment as our corps officers and pastors on June 27, 2018. 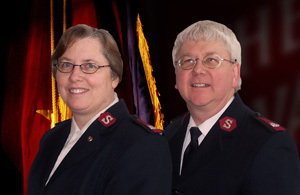 For more than 30 years, the two have served The Salvation Army; prior to their arrival in Fond du Lac, the Welchs served the Salvation Army in Porter County (Valparaiso, IN) for almost 11 years. How blessed are we to have all their experience and compassion helping us continue "Doing the Most Good" in Fond du Lac!